Many people expected star forward Evgeni Malkin to find himself on a conference call with the NHL’s department of player safety after the Pittsbigth Penguins centre was ejected from Wednesday night’s game against the Washington Capitals. 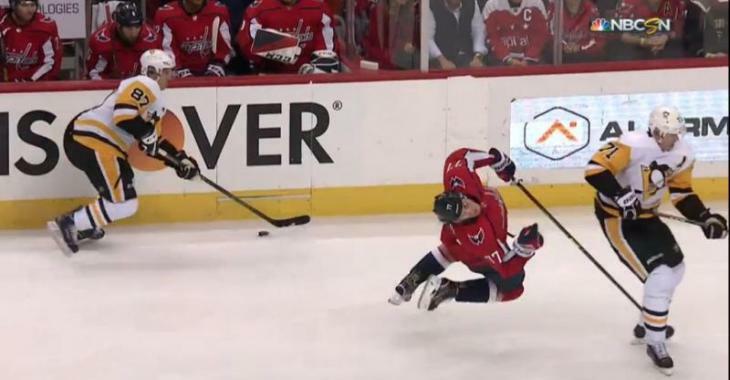 The Russian forward was assessed a major penalty for an illegal hit to the head and a game misconduct after laying out Caps forward T.J. Oshie early in the third period. As you can see in the video above, at the top of the page, Malkin crossed the Washington blue line as he dropped the puck to a teammate before skating right through a backchecking Oshie. Malkin’s right shoulder connected directly with Oshie’s head. One of the replay angles clearly shows that Malkin sees Oshie coming when he leans into him. The game was tied 1-1 at the time of Malkin’s five-minute penalty, which the Penguins managed to kill off successfully. Oshie went to the Capitals dressing room following the hit to undergo protocol and missed more than 10 minutes of the third period before returning before the final buzz. And success seems to be ongoing as Sportsnet's Chris Johnston just reported that Malkin will not face supplemental discipline for his hit on Oshie. "He was deemed to be bracing for contact a fraction of a second after releasing the puck. Didn't change angle or hit Oshie with his elbow or stick." At least, the Capitals can rejoice in the fact that Oshie managed to return late in the third period and scored the go-ahead goal with 74 seconds remaining.